I am home from the in-laws and we had a great time with the family. 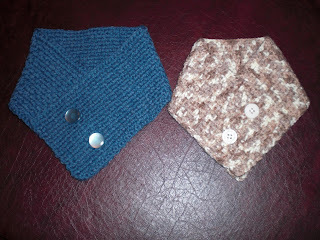 I worked on many scarves while I was there for the Bridge Project and mailed off a package on the 29th to Sandy. It had some hats, scarves and a nice big shawl. I am sure they will be put to good use. On this last day of 2008, I want to tell my readers how much I appreciate all the comments and love shown me and I wish you a very best 2009! Cheers!! 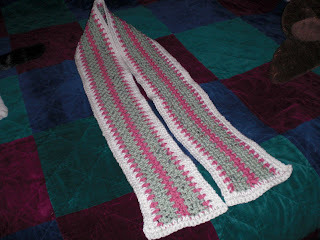 Here is the scarf that I mentioned on my last blog post. Finished it up this yesterday morning. 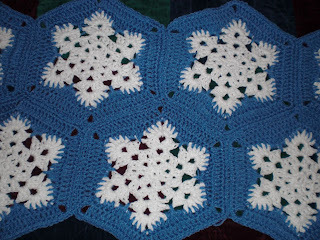 I love this pattern and it can be found on my side bar at "Suzie's Stuff". 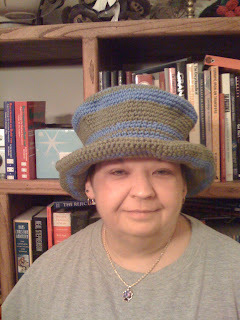 She has many, many wonderful patterns on her site. Please take a moment and click on the photo below so that you can see the larger picture and the detail better of the slant stitch. 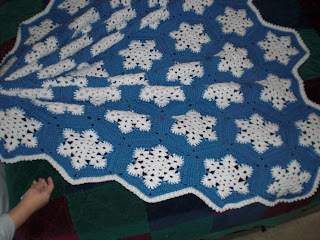 I will be doing this pattern again. I personally feel that it is perfect for a mans scarf. 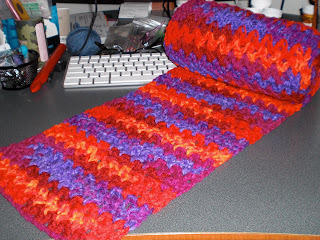 I am now working on a "V" stitch scarf then I need to get two pillows completed. 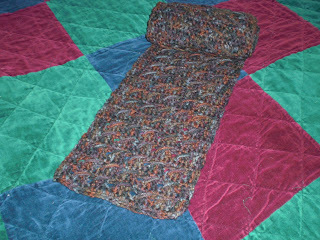 The pillows are for the nephews to go with the afghans that I made them that they just love. :) I was so worried they would not like them. We just found out that friends of ours that now live in Washington are awaiting the arrival of their daughter due to make her appearance to our world next month, (Jan). This is their second child. Their first is a son named Ian and he was born last October, 2007. They are a wonderful couple and I am sure great parents and I hope to get too see their beautiful children. They are so truly blessed. 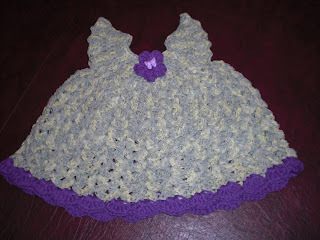 Anyway, I naturally had to make something for the baby at that moment and below are photos of my efforts. 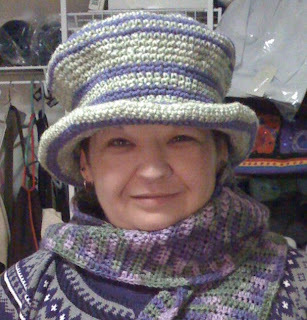 Just a quick note to mentioned that I used an "F" sized hook and the yarn of choice was SWTC's Amerah, which is 100 percent silk. It is a beautiful yarn but it sure sticks to your hook as you're working with it. 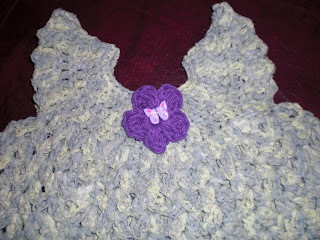 The color was "Lush" and the flower and trim are done with Lion brand cotton. Here are the photos, one a close up and the other a shot of the entire dress. 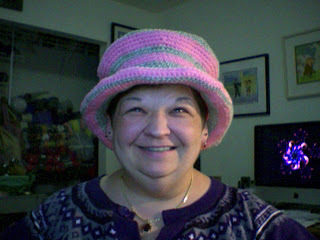 Coming soon.....A bonnet or hat to match the dress, I haven't decided yet. Also I am working on a scarf for my brother in-law whom is a lawyer. 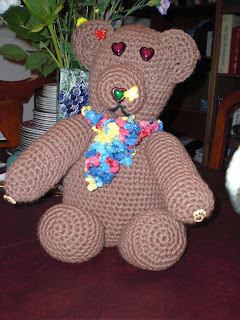 I wanted something very manly and I love this yarn and the pattern. I will close for now but wanted to wish all of my readers a wonderful day. P.S., I go this morning to get my stitches out and I can't wait. 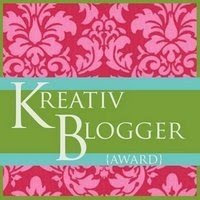 How could I forget to mention the new LOGO that my wonderfully talented, beautiful, smart sister, Ghost made for me and I just love it. You're probably thinking, "hmmm barns are normally red in color". 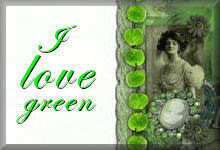 Well right you are, but if you know me then you know that green is my FAVORITE color so, therefore my "Yarn Barn is green". I also wanted you to take at the look at how stuffed my barn is getting. Yes, I am going to have to make some other storage arrangements eventually or else it will be all over the place and you will not be able to see my blog to read it because of all the yarn overflow. 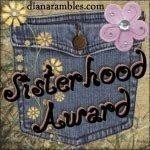 I will close this post with a great big *HUG and KIss* to my sister, Ghost!! I have only one sister and how lucky was I that Jehovah God gave me the best sister in the universe! I love you sis! !